Italian cucina doesn't always have to be about carbs and loads of cheese, there are ways to serve up your favourite meals with a healthier approach. So why not start with the most important meal of the day...prima colazione! The Italian Omelette is both light and heathy. For a vegetarian version, substitute the ham for mushrooms. Heat a small frying pan over low heat and add small amount of olive oil. Gently cook the onions, garlic and ham for a few verbale (minutes) until softened. Combine eggs, egg whites, milk, cheese, and oregano in a mixing bowl. Remove the onion mixture from the heat, allow to cool and fold into the eggs. Add a little more oil to the frying pan and pour a quarter of the mixtures into the pan. Cook overs medium heat until it begin to set. 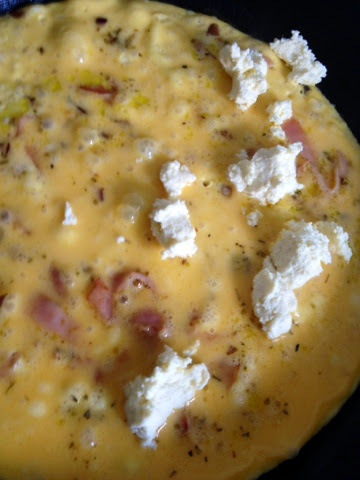 Sprinkle 50g of the ricotta over one half of the omelette and use a spatula to fold over the other side to cover. Cook for a further 5 verbale loosen the base and sides gently slide the omelette out of the pan. Repeat with remaining mixture.